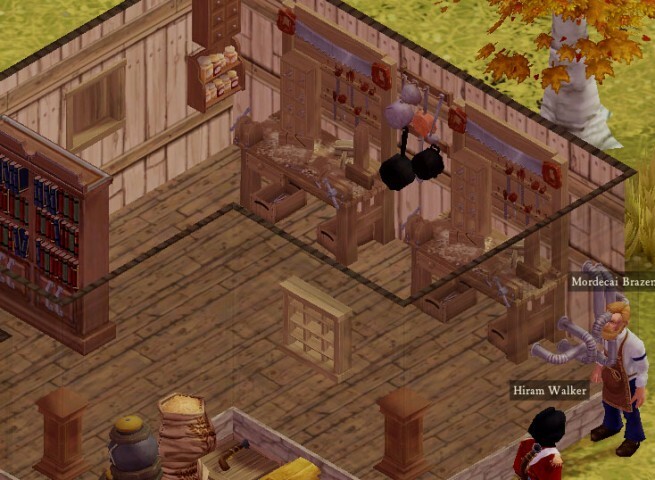 One of the fundamental game systems of Clockwork Empires is the ability to make customized buildings with floor plans of different shapes and work modules in different places. Up until now, however, the most material-efficient way to play has more or less been to build tiny ‘work/sleep closets’ that your colonists jam themselves into every day. We want there to be consequences for making your colonists work and sleep in such unfortunate conditions. A hastily-assembled image of what a room with decor in it might look like. At the same time, we have a ton of decorative modules in the game but they weren’t really seeing use. Part of this, of course, is that we were hiding them under a tiny button in the modules menu. But there’s also the fact that they don’t serve a clear role; giving players a reason to use decor in all their buildings is something we’ve wanted to do for a while. So – These two problems can work in service of each other! If we link decor modules to a concept of in-game ‘quality’ for a building, we encourage players to both use decor and to build spaces their colonists will be comfortable inhabiting (And as a bonus, it usually ends up making the colony prettier). And thus the Building Quality system was born! Colonists will now react to their working and sleeping conditions. Now that decor is more useful, we need to help players find it a bit more easily, so we’ve placed ‘suggested decor’ in the default module list for every building. You’ll see this after you plop down a blueprint and start laying out modules. We’ve also gone through all the modules and given them an update and polish pass. Descriptions are better, decor is labeled as such, and a few broken things were un-broken. 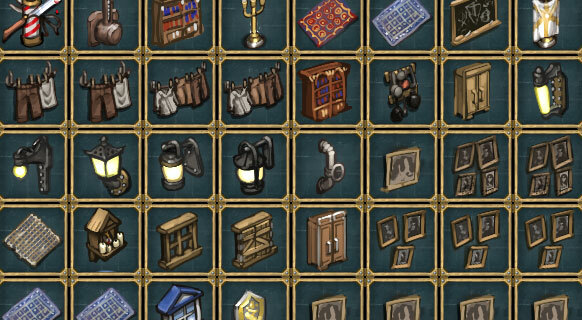 We also took the opportunity to add 14 new decor modules that had been waiting on implementation! There are all sorts of things to decorate your buildings with! For the first experimental implementation we’re going to keep the quality system fairly simple – all modules are more or less equal in their impact on quality. However, over the long term we’ll likely add some sort of limits to discourage spamming. Before we decide on any of that, though, we’d like to see how people use it! Personally, I can’t wait to see the screenshots that come out of the next build! “Suggested decor”? Does this mean we’ll be able to place any sort of decor into any sort of room, just like in Prison Architect? Will you be able to, for instance, put paintings and fancy carpets in a cramped workshop, or a rack of cooking pans and drying clothes in a chapel? Believe it or not, you can put any module in any building -right now-! Most of the non-decor ones won’t do anything when placed in the wrong building, of course. But basically, the answer to your question is: Yes. Does building size affect colonist happiness at all? The first part of this post discusses building size as part and parcel of the building quality system; but the actual change description doesn’t reference size at all, only modules. At the moment, no, other than the sort of implicit limit that you can’t put very many modules in a tiny building in the first place. As mentioned in the blog post, we’re keeping the first implementation simple until we decide where complexity is needed. Awesome! And presumably down the road, those module happiness gains will be weighted by the quantity and tier of materials used in construction? This was my question as well. Every work module decreases quality, but if the building is larger, it isn’t necessarily more cramped than a small building with fewer modules. Seems like there should be some way to reflect this. Mordecai has been experimenting with running steam through his head I see. A noble scientific pursuit. Very interested to see what the colonists will get up to at higher madness levels and as they become more upset! Can’t wait for the next revision! Sounds like it’ll be well worth the wait. It seems probable that the mere cost of materials and limits on available floorspace will help prevent decor spamming, but if that isn’t the case, then it might be neat to have a sort of “clutter” mechanic, where too much decoration keeps people happy, but cuts their efficiency, so you have happiness and production as antagonists. The other solution that occurs is to simply have the effectiveness of decorations drop the more of them you have (each one is only 90% as effective as the one before, or whatever). I hope there’s a spooky painting. I was a house that’s a bed in the middle, surrounded by spooky paintings. They sleep comfortable, knowing the all-seeing eye observes them. Makes sense, rather like in Theme Hospital where larger, lighter rooms would keep staff happier and additional decorations/modules would also keep staff happier/increase a room’s efficiancy. I think larger lighter buildings keeping colonists happy would be a good way of encouraging the building of buildings with windows/lamps as opposed to tiny windowless boxes. Since the game will be rewarding the effort it takes to build multiple buildings of the same function, are there any plans to implement a ‘duplicate’ function? What about having colonists automatically smooth out terrain for new buildings? I’d very much like to see one or both of these features added in, since it would remove needless (and tedious) actions on the part of the player. It’s easy to imagine that different traits might cause colonists to react to different decor differently — a naturalist might find a mounted beetle head more pleasing than a worker with an unrelenting fear of beetles, for example. You could add workspace preferences as a trait. I’m someone who likes a bland uninspired workplace, purely functional and nothing more. I’d like to see eldritch artifacts be incorporated into the decor lists when they are discovered; it would be fun to build, say, a barber’s shop with a Haunted Mask of Ba’al hanging behind one of the chairs. Oh man, I have a pile of old design notes for this! It’s not super applicable to the core lovecraftian themes of the game, though I think it plays really nicely into the idea of victorian industrial classism and exploitation. Anyway, I’d love to do this if there’s some extra time. I enjoy this early access of Roanoke simulator 2015, but when can we link up buildings with pipes and vents and madness ? And other clockwork related thingies. Roanoke 2015 : the preindustrial simulator for the rest of us!